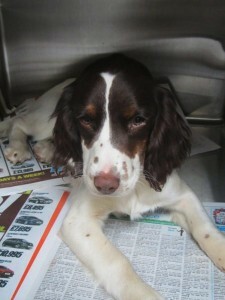 Teal is an adorable 5 month old Springer spaniel that presented to us this week with a stomach upset. Both of the family dogs had been suffering from sickness and diarrhoea in the previous week but the older dog had gotten over it. Poor Teal “was still not just right”. He had lost some weight and could keep nothing down. On examining him, Gareth Torney could feel a doughy mass inside Teals belly which was hurting him and x rays were recommended. This is the x-ray. 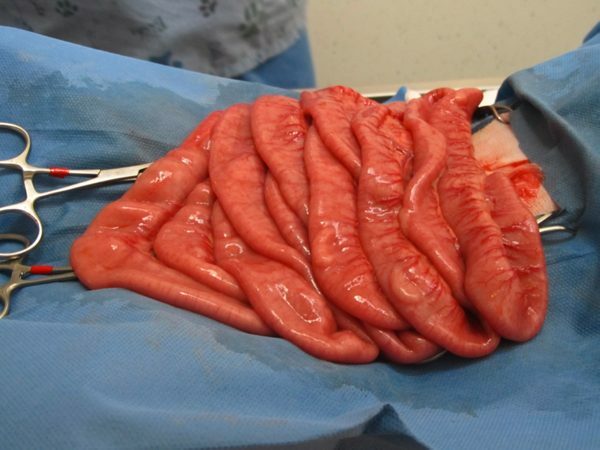 The intestines look very doughy and there is retention of gas which is a sign of a blockage. 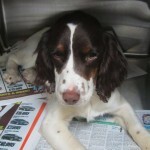 When teal was anaesthetised Gareth confirmed the presence of a blockage and recommended exploratory surgery. This is a picture during surgery of the blockage. A piece of Teals small intestine had invaginated into the large bowel on the right hand side of the picture and in essence had become blocked. Without surgery this piece of bowel would have ruptured and that would be the end of Teal. 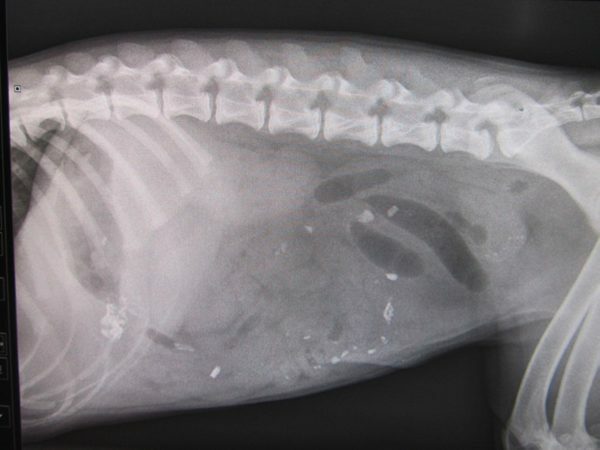 This is called an INTUSSUSCEPTION and is more common in young dogs and in children. Thanks to the owners prompt recognition that Teals condition had become more serious Gareth was able to tease the intussecption apart without having to cut out any diseased bowel. He then layed the intestines out and put small tacking sutures between the loops to stop this happening again. It is believed that in young dogs when the guts are affected by a bug, virus or worms that they become hyperactive and that this predisposes to the condition. 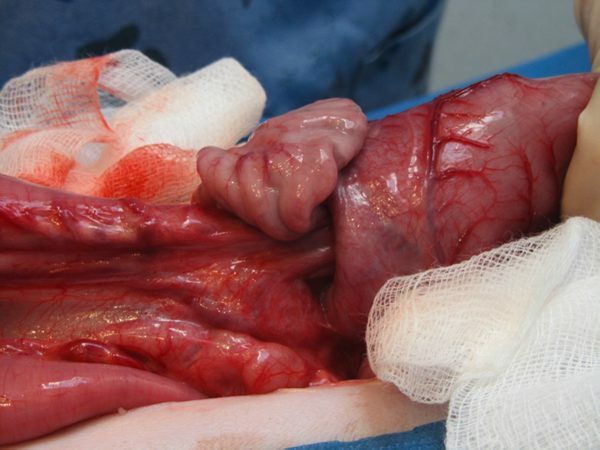 The small intestines layed out before tacking sutures placed to stop the condition recurring. Thankfully Teal has recovered uneventfully and is back enjoying his food again.